In Color Order: The Big News! Today I am very excited to announce, that I will be designing fabric for Art Gallery Fabrics! 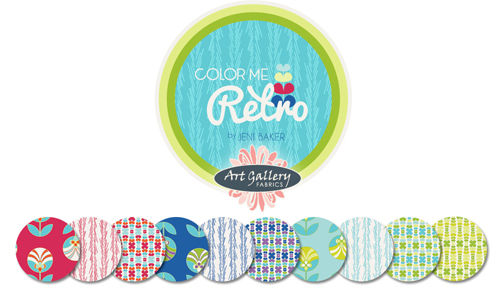 I have a mini collection that will be coming out this Fall, called Color Me Retro! You all know how much I love, love, love their fabrics, so it's really a dream come true! You can see all the prints on the Art Gallery Fabrics website, here. It will be in stores in February-March 2013! CONGRATULATIONS! :D What huge, exciting news. I'm so looking forward to seeing your fabrics in stores! Congrats!!!! It looks ahhhhmazing! Love it!!! Great job! This rocks! I was hoping this was your big news! :) Congrats Jeni!! I am so happy for you, Jeni!! Congratulations! I am so looking forward to Color Me Retro! Congratulations! That is so awesome and o man - I love the aqua/greens on the last 4 swatches on the right up there. Can't wait to see the real thing! So exciting! Congratulations Jeni. Love the new line. Looks beautiful! Congratulations and best of luck to you in your new ventures. I've loved following along in your blog for some time now and this looks like a wonderful extension to what you do best. Congrats Jeni! Can't wait to see what you turn out - the design board is uh-MAZ-ing! This. Is. So. Awesome! I'm excited for you and I can't wait to start working with your adorable fabrics!!! Congratulations! I've been silently following your blog for awhile now - thank you for being such an inspiration. Many blessings in your new endeavor! I knew it, I knew it...you have such a way with color, someone just had to scoop your talent up. Congratulations!!!! wonderful and congratulations! i love all the retro colors. they are fun and bring back so many memories of my grandmas and great grandmas! look forward to seeing what you bring out! Jenny, Congratulations! This is fabulous news! You must be bursting with joy right now. You are such a talented young lady and have such a bright and colorful future ahead of you. I'm looking forward to your collection. Again, congratulations! Yay Jeni! So excited for you!! Can't wait for your first collection to come out, it looks amazing! Congrats! so excited for you! what an awesome opportunity. I am so impressed by this line, it's super cute! Great job, and congrats! Congratulations Jeni! That is super exciting news! I'm looking forward to seeing what you create from your own line! Congratulations! I badly want to do my dining room in aqua and coral-red, so this news may end up being good for selfish me. Napkins? Table runner? SEAT CUSHIONS?! Love the pretty "basics" you've included. Congratulations! That's very exciting. The new header is great. What great news - congratulations Jeni! Congratulations, Jeni! Your designs are beautiful! I can't wait to sew with some of them. congratulations, this will be a definitely anticipated line of fabrics. This is awesome!! Congratulations! Love you blog and love the new fabric designs. Congratulations, Jeni! You deserve this so much! Can hardly wait for the line to be out! Are you SO excited!!!! I love Art Gallery fabrics, their base cloth is always the BEST. Congratulations, can't wait to see! congratulations on your beautiful new fabrics! i love all your ideas and look forward to every new post on your blog. That is AMAZING! I love Art Gallery Fabrics (who doesn't?) and this is just terrific news. Congratulations to you!! Living the dream :) Congratulations!! Congrats!!! Couldn't be happier for you! Jeni, this is just the best news ever. I know I said it over on IG, but I'm just so thrilled for you! I can't wait to sew something using your designs!! Congratulations, Jeni! How exciting! I love the Dulcette print! congratulations! What exciting news. I'm looking forward to buying some of that lovely fabric. And then I'll make more Jeni bags! Jeni, that's insanely awesome! Congratulations! I can't wait to see where this takes you. How wonderful! I love the mini collection, it will work perfect in a project I'm planning. Enjoy every moment of this ride! Congratulations, what an accomplishment. Love that patterns and colors. Coming from Denmark its fun to see all your nice kitchenware. Congratulations!! Gorgeous prints, how exciting!!! I saw it on a few places on Facebook before I managed to start reading my blogs for the day. Congratulations! I am so tickled for you!! What a cute introduction video! I especially love the "kitchenette" fabrics! Love the greens! Good job Jeni! Dang, girl! Quit your day job!! You must be over the moon living the dream:D Congratulations. They are beautiful. Oh Jeni! Big congratulations. I love your stuff and can't wait to see the new fabrics for real. I loved seeing the video you did. Congrats again. Seriously, you are so cute. Congratulations, this is amazing news! Onwards and upwards, can't wait to see more fabric from you! It is SO fantastic, Jeni! I'm in love. Woohoo! Congrats! It would be extremely interesting to hear about the whole process: from your design ideas on your time, to presenting them to the AGF team, and so on. If you're allowed I'd be very interested. Especially from someone who doesn't necessarily have an art/graphic design career already. It couldn't have happened to a better person! I am thrilled for you and will be buying it for sure! Jeni Congrats! That is fabulous! how exciting! Good for you Jeni! Congrats! They are very pretty! I can't wait to see all the fabrics in person! These as sooo beautiful! I can't wait to use them!! Congratulations on a wonderful fabric line! That amazing!!! I can't watt to see it in person :) Congrats I bet you are over the moon! Yay!! I love reading your blog and following your adventures. I get inspired by all your color choices. These fabrics look spectacular. I will be in line to get them once they're available. Good luck to you! It'a like pyrex and Denmark had a happy collision! Awesome news, Jeni! I'm so glad we were able to meet in KC! Congrats! You're livin' the dream!! Congratulations Jeni, what a beautiful eyecatching line! love it! Congratulations Jeni!! I wish you the best of success! Color Me Retro looks great!! George must be very proud of you!! for bringing them back. Can't wait. Woohoo!! I can't wait to have these in my hands! SO happy for you, Jeni!! The line is so .... WOWWWWWWWWWW ... I LOVE THEM ALL!!!! Fabulous news! I love it already! wow! congrats! your fabrics look great! Congratulations....love the fabrics and can't wait for them!! I am so happy for you but just a little jealous too. I have a few fabric designs that I have created that I would love to get picked up by a company. A big congratulations to you on living the dream! such a gorgeous line- and a great logo! you are on a roll! Congratulations! I can't wait to buy some! HUGE Congratulations! You are living the dream, enjoy the ride! I am so looking forward to seeing your new fabric and follow how you use it. Wow! Super exciting! Can't wait to see all the awesomeness that you come up with. I'm sure it will ROCK! congrats! the line looks fabulous and on Pima cotton too...oh be still my heart! Congratulations, Jeni! You deserve this wonderful opportunity and we are all so lucky to have access to your talents. Congrats! I can't wait to get my hands on some! Yay! I will definitely be buying some. Thank you for all that you do for the quilting community. Eeek! So happy! Congrats, Jeni! We are so excited to hear you've joined Art Gallery. The collection looks awesome and we can't wait to see more! How exciting! I absolutely LOVE your collection, and can't wait to see more from you! Congratulation Jeni!!!! Will be waiting for your designs and best of luck ! I knew it!!! AGF is my favorite! I think your line looks fab. MANY CONGRATS! COOL BEANS! Congrats! YAY, YOU! HOORAY!!!!!! So proud for you, young woman! I love the red and aqua colorway! Wow, a local designer!!! Good for you, the fabrics are fabulous. Congratulations! Congratulations! That is so awesome and exciting! I'm just so thrilled for you! Great job! Yay I am so happy for you and can't wait to see the line in person!! wow jeni, I thought you were up to something big. It's going to be beautiful!!! congrats, you probably worked super hard on it and it looks amazing. when's your book coming out?! So, so happy for you!! Wonderful news and a great set of prints! OMGosh! So excited for you! It would be funny to you how many times I thought about you today and wondered what the big news could possibly be! CONGRATULATIONS JENI!!!!! Massive congrats--what a gorgeous line!! Congratulations Jeni! I can't wait to see the fabrics in person - love them! Congratulations, Jeni!! So happy for you- you deserve it!! Love the new fabric!! Fantastic Jeni! I will be snatching that stuff up as soon as I find it! Ama-zing! Good for you girlie! So excited for you!!! Congrats!! These are just fantastic. We are very lucky, and you are so talented! Congratulations! I'll be getting these for sure! JENI!!! So exciting, I love the little sneak preview of the fabrics (NEED THEM) and you're just the cutest gal ever! Love it when I get to see bloggers in motion. :) Congratulations, can't wait to get my hands on these!! Congratulations, Jeni! Way to go! Congratulations! That's such exciting news. Congratulations Jeni. I just love the prints - they are fabulous!! Congratulations Jeni! I saw the big news on the Art Gallery website earlier. Your fabric collection looks amazing, can't wait for it's release. I'm sure it will be a huge success, you really deserve it to be, well done! Congratulations! Exiting! Love your designs very much. wow that is amazing! Congrats and best wishes in this new venture!! Congrats, Jeni! That is so exciting! That's wonderful news! I knew a little about it yesterday because I follow the Art Gallery blog. Really cute fabric collection too. Congrats Jeni!! What awesome news! I'm very excited to see the fabric in person. Yay! Congratulations, Jeni! I always knew you were a girl who was going places! Your new line is beatiful. Whoo HOOOOO Jeni!! Congratulations on your new fabric line. How exciting! It looks amazing and I can't wait to get me a little bit of some colorful fun. Congrats! You have achieved the quilt blogger dream. I can't wait to get my hands on your collection (which luckily comes out around my birthday). It is lovely and I see so much inspired sewing in the future. Congratulations Jeni, definitely exciting news!! Love the vintage sheets and thrift shop finds from yesteryear!! Looking forward to seeing 'Color Me Retro' in person!! Wishing you the best as you enjoy your new adventure...for sure you are having a wonderful Wednesday, floating on cloud 9!! Thrilled for you and me! Your fabrics are gorgeous and I hope that I can get some here in Australia, but if not, I will happily purchase online from the USA. Also, it was great to be able to hear your voice and the excitment in it, instead of just reading your news and trying to gauge your excitment. Congratulations! That is so cool! congratulations! i love your fabrics=can't wait to get my hands on some! Congratulations! Your fabric looks adorable. Congratulations! Awesome news! I'm loving that raspberry. Congrats! I love the video! Congratulations! Your first line look lovely! Can't wait to get my hands on some. I don't know if you saw my tweet on Tuesday, but I am over the moon excited for you. <3 You are awesome, and you deserve this great success!! Congratulations Jeni! That is very exciting. Very well done! Congratulations! I can't wait to see more of your collection! OMG! OMG! This is fabulous news. Huge congratulations. Wiating that long to be able to get my hands on some of that is going to be really hard. yay!! i'm so happy for you, Jeni! I can't believe I missed this...never going on holiday again....wow, that is such fab news and so deserved- and the fabrics do look fantastic (I just downloaded the Jpeg swatches and am playing round with combinations. I am so excited! I love the collection and can't wait for it to come out! Congratulations!!! Fantastic news Jeni!!! So excited for you!!! Awesome! What super exciting news - and it couldn't happen to anyone sweeter and more deserving! Yay!